The SSD is a huge benefit to PCMark, and since this is laptop testing I can't just use the same image on each system. Anand covers the desktop side of things, but I include PCMark mostly for the curious. 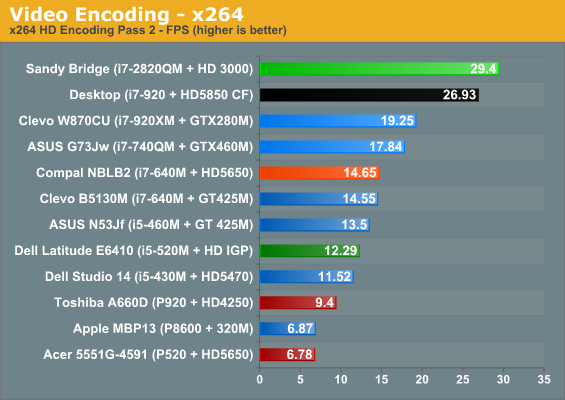 I could try and put which SSD/HDD each notebook used, but then the text gets to be too long and the graph looks silly. Heh. 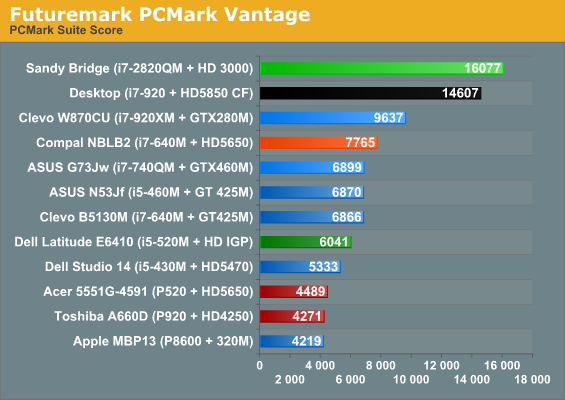 the synthetics benchmarks are all run at turbo frequencies. 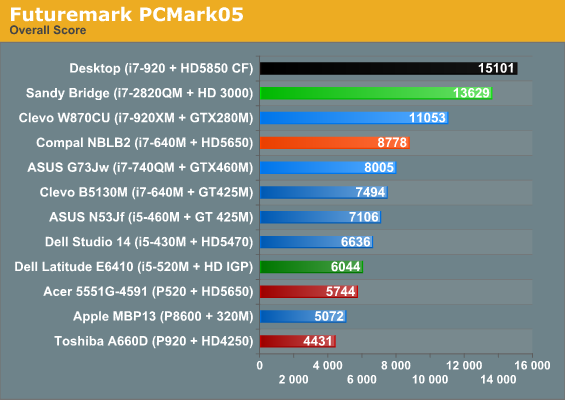 the scores from the 2.3ghz 2820qm is almost the same as the 3.4ghz i7 2600k. 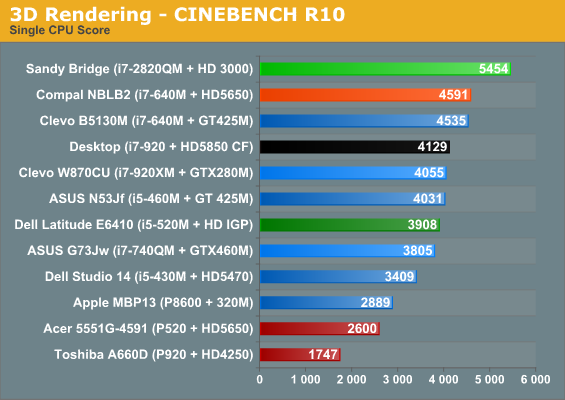 this is because the 2820qm is running at 3.1ghz under cinebench. no one knows how long this turbo frequency lasts. maybe just enough to finish cinebench! 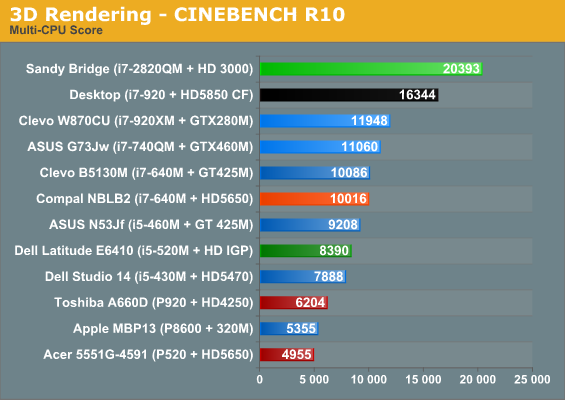 If you do continual heavy-duty CPU stuff on the 2820QM, the overall score drops about 10% on later runs in Cinebench and x264 encoding. I mentioned this in the text: the CPU starts at 3.1GHz for about 10 seconds, then drops to 3.0GHz for another 20s or so, then 2.9 for a bit and eventually settles in at 2.7GHz after 55 seconds (give or take). If you're in a hotter testing environment, things would get worse; conversely, if you have a notebook with better cooling, it should run closer to the maximum Turbo speeds more often. Just like any other low-end GPU (integrated or otherwise) I believe most users would rely on the HD3000 just for undemanding games in the category of which I would mention Civilization IV and V or FIFA / PES 11. 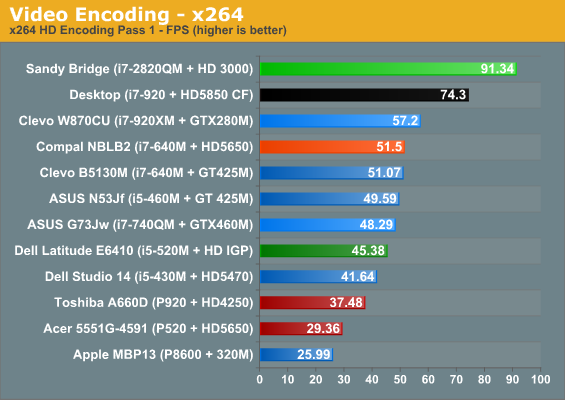 This goes to say that I would very much like to see how the new Intel graphics fares in these games, should they be available in the test lab of course. I am not necessarily worried about the raw performance, clearly the HD3000 has the capacity to deliver. Instead, the driver maturity may come out as an obstacle. Firstly one has to consider the fact that Intel traditionally has problems with GPU driver design (relative to their competitors). Secondly, should at one point Intel be able to repair (some of) the rendering issues mentioned in this article or elsewhere, notebook producers still take their sweet time before supplying users with new driver versions. A more intelligent thing to say would have been: a 2008 CPU (P8600) with an nVidia 320M is consistently slightly slower than a 2011 CPU (i7-2820QM) with HD3000, don't you think? This sounds like it is a big advantage for me...but only because Intel refused to produce quad core CPUs at 32nm, so these by default run quite a bit faster than the last gen chips. Otherwise it sounds like they're wasting 114 million transistors that I want spent on the CPU-whether it's more cache, more, more functional units, another core (if that's possible in 114 million transistors) etc. I absolutely do NOT want Intel's garbage, incompatible graphics. I do NOT want the addition complexity, performance hit, and software complexity of Optimus or the like. I want a real GPU, functioning as a real GPU, with Intels' garbage completely shut off at all times.